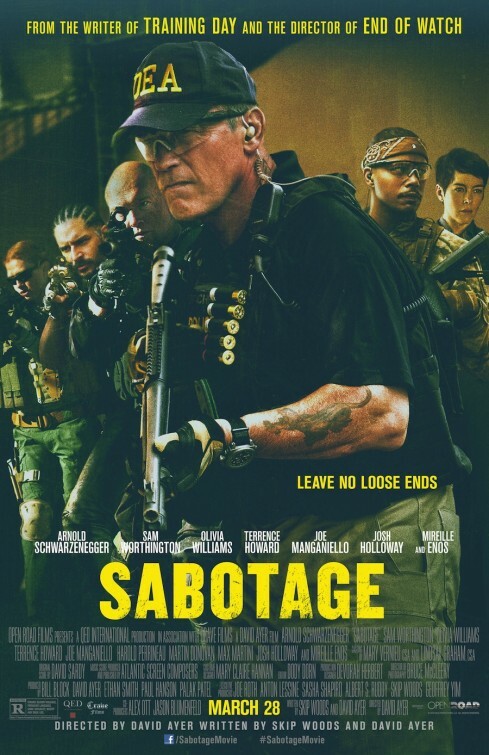 The crime thriller “Sabotage” is the least predictable and most intense of the handful of post Governator action movies Arnold Schwarzenegger has starred in. Last year’s “The Last Stand” had a sense of humor about it, along with a nod to classic Westerns, that lightened the bloody violence, but here is a gritty film that proudly displays its tattoos and adrenaline in a testosterone-laced delivery that even has its few women posing a legitimate threat to their manly costars. While there is some humor here, it comes from R-rated bro-camaraderie, that is – the kind of jokes you crack after you’ve just turned a bad guy’s head into a squishy tomato during a drug raid. Veteran John “Breacher” Wharton (Schwarzenegger) leads an elite team of DEA operatives who specialize in “breaching and clearing” (hence the name) drug compounds and safe houses, with the mission being to take down drug cartels. They behave more like a dysfunctional family than they do federal agents. After one high-profile raid, suspicions arise within the team when the ten million dollars they intended to steal from the cartel goes missing. Their superiors are also suspicious and disband the team, as they continue to closely monitor everyone, especially John. John is given a cubicle while the rest of his team loaf around and get rusty playing PS4. He has feds staking out his home, following him and even joining him in the washroom. Months pass and after the internal investigation runs cold, John is reinstated and given his eager team back. That’s when things really start to go downhill. Members of John’s team start getting brutally killed off, Investigator Caroline Brentwood (Olivia Williams) is on the scene trying to make sense of it all. She and her partner, Jackson (Harold Perrineau) are baffled by the murders and run into difficulties with the remaining survivors of the team. As Caroline gets deeper into the investigation, she has to determine whether or not the murderer is connected with the Mexican cartel or one John’s own team, while past secrets and recent deceptions surface. Co-writer/director David Ayer is known for making dramatic thrillers that where street life collides (and often mirrors) police life. The films he’s previously directed, “Harsh Times”, “Street Kings” and “End of Watch”, all take place in and around Los Angeles, usually showing police corruption and gang life in an immersive and realistic manner. “Sabotage” employs some of the same handheld and first-person shooter camera approached Ayer has used before, but there’s a distractingly absorbent use of blood here. Characters are washing it off their hands and slipping and falling in it. We see bloody innards sprayed on walls and a body nailed to a ceiling, amid all the machismo on display. There’s an expectation of violence for a movie such as this, but it eventually becomes almost as assaulting to the viewer as it is to the recipients of it on-screen. What frees us from getting repulsed or offended by all the carnage, I suppose, is a lack of connection to the characters getting knocked off. 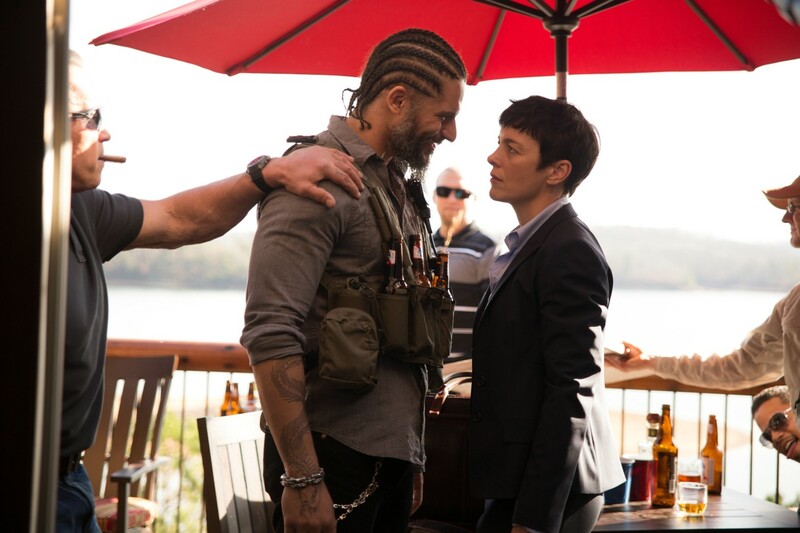 Breacher’s team are composed of abrasive, unpleasant and one-dimensional characters with names as cliched as their behavior: Monster (Sam Worthington), Grinder (Joe Manganiello), Neck (Josh Holloway), Tripod (Kevin Vance), Pyro (Max Martin), Sugar (Terrence Howard) and Lizzy (Mireille Enos). Okay, she doesn’t have a G.I. Joe code name, but she more than makes up for it by being the most unhinged of the bunch, often jacked-up on drugs while chewing and spitting out lines that upstage the fellas. Since Ayer really doesn’t give us time to differentiate who these thin characters are, other than stock portrayals, it’s hard to care who’s getting killed or who’s possibly betraying who. Thankfully, the always enjoyable Olivia Williams, whose performance isn’t as amped as just about everyone else (accept Schwarzenegger) around her, is a standout. Her character isn’t impressed or phased by the team’s posturing and goading, instead she holds her own, chewing on dialogue as good, if not better, than anyone else. Williams and Perrineau have great natural chemistry together too, almost as if they’re auditioning for Season Two of “True Detective”. But the most surprising pairing is Williams and Schwarzenegger, whose characters go from stepping around each other in order to get their way to becoming an unconventional and unsuspecting action duo. Schwarzenegger has smartly settled into playing to his age while remaining as charismatic as ever. He’s the rock of the movie, with Breacher observing his team’s bickering and yelling, instead of participating. His character has more going on internally and as the movie concludes, we walk away admitting that this could be his most nuanced performance yet. Knowing in advance that “Sabotage” was made by Ayer and included the Mexican cartel, I naturally assumed that this film took place in the City of Angels as well. I don’t know why it took me an hour into the film to realize that the story was actually taking place in and around Atlanta, Georgia. It just seemed like the abrasive, tattooed and pierced, gang-like mentality of this team fit better in South Central, especially considering Ayer’s track record with that area. Coming to that geographic realization while watching “Sabotage” was the first of several puzzling surprises. Granted, these aren’t necessarily rewarding surprises though. For example, the story’s main twist in the last half is more like a jolting sharp turn that comes out of nowhere. Unearned and inconsequential, what is meant to be a jaw-dropping moment feels more like a shoehorned plot device. Again, it would matter more if we cared more for these characters. If you’ve seen the trailer or TV spots for “Sabotage”, you may feel like you know what you’re going into. There’s a bit of a “Predator” vibe (if we were to compare it to Ahnuld’s other movies), as soldiers are getting plucked off one by one, an age-old formula that’s been around since Agatha Christie’s And Then There Were None aka Ten Little Indians. 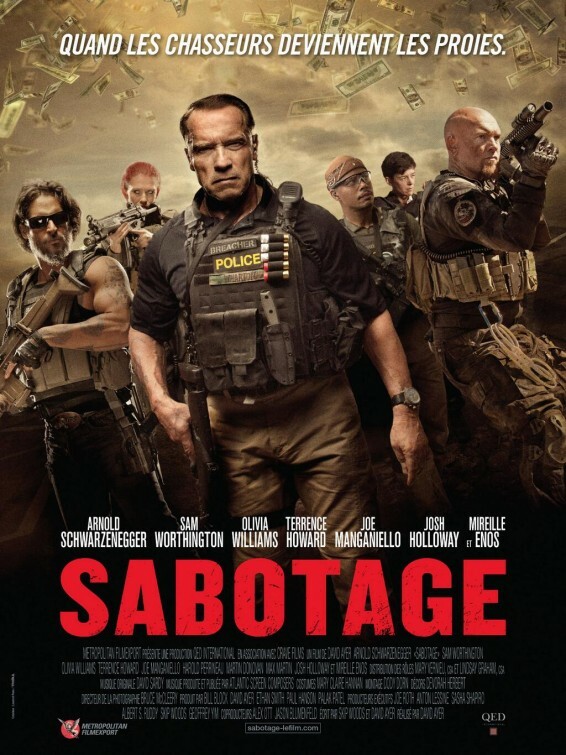 That’s not a far off comparison, considering the working title for “Sabotage” was “Ten”. Open Road Films knows that a movie headlined by an aging Austrian needs to be more than just a number though in order to get butts in seats. So, the studio has spun a clever and deceptive marketing campaign in the months leading up to the movie. You won’t know it until you see the movie, but it’s not the first time a studio has inserted scenes – even lines – that aren’t in the theatrical cut. The trailer for “Sabotage” is even set-up in such a way where you think you’re getting everything spelled out for you – like just about every other trailer. But that’s not the case here, which becomes obvious during the first fifteen minutes of the movie. I’m not going to divulge much, but will admittedly understand (and shake my head at) the studio’s bait and switch tactics in promoting the movie. “Sabotage” is a bit too wild and crazy for its own good. It’s not a bad movie for what it is, but its missing more than a few key elements. Ayer had an opportunity here to show the mental and emotional toll that comes with such an intense occupation, but instead got lost in a macho cacophony of guns and blammo.